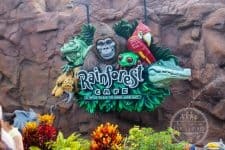 Not making it to Mickey’s Not So Scary Halloween Party this year? You can have one of the extra special treats served at the party right at home! When you attend Mickey’s Not So Scary Halloween Party, they offer some special treats to help get you in the Halloween spirit. Here’s a look at the menu from the party guide. The one treat that immediately caught my attention was the Spiced Pumpkin Waffle Sundae. 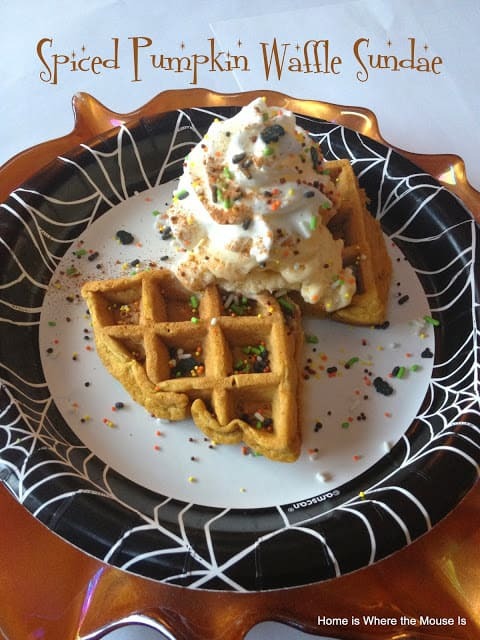 It is simply a spiced pumpkin waffle topped with vanilla soft serve and pixie-dusted with powdered sugar and Halloween sprinkles. Not only does it sound delicious, but I knew it was a treat I could easily replicate at home. Want to know how to make one? 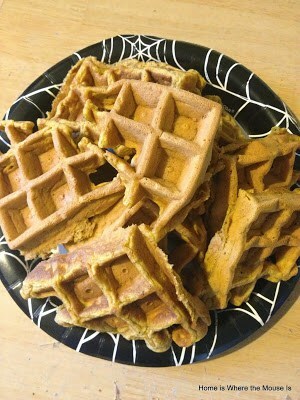 As luck would have it, I found the perfect recipe for spiced pumpkin waffles in my Pancakes and Waffles cookbook. 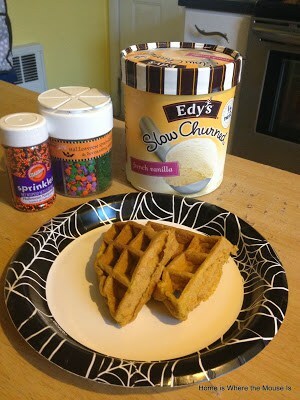 First, whip up a batch of waffles (recipe to follow). Top your waffles with a generous scoop of vanilla ice cream. Swirl on some whipped cream and sprinkle on some festive sprinkles. I just so happened to have bat shaped sprinkles in my pantry, so I used those along with some orange and black nonpareils. We might not be making it to the party, but we can sure treat ourselves to some delicious dessert! Sift the flour, baking powder. baking soda, cinnamon,nutmeg, ginger, salt and pepper into a large bowl. Put the eggs, sugar, pumpkin, milk, butter and zest into a second bowl and beat well. Gently fold in the flour mixture. 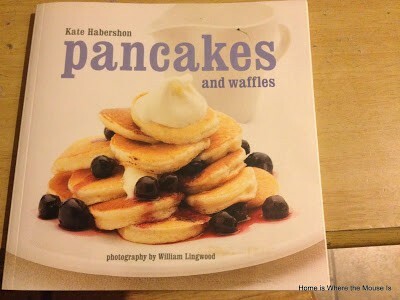 Depending on the size of the waffle iron, spoon about 1/4-1/2 cup pf the batter into the preheated compartments. Cook until crisp, 4-5 minutes.